I was really excited to try this chocolate-orange bread recipe I found here, but when I pulled it out of the oven I found that it wasn’t what I had hoped for. I doubled the recipe, and am notorious for forgetting to double all of the ingredients in a recipe, so I may try this again at some point in a single loaf form. Still, the loaf tasted very little like chocolate, and even less like orange, so I admit to some disappointment. Having almost two entire loaves of the stuff sitting around with no discernible purpose, and having just bought the most delicious liquid on the planet (dark chocolate almond milk – yum! ), I opted to try out a bread pudding, something I haven’t been too enthused about in the past. It was well worth the experiment, though it was pretty thick and maybe not as puddingy as a traditional bread pudding? Not sure, as it’s not really my thing. 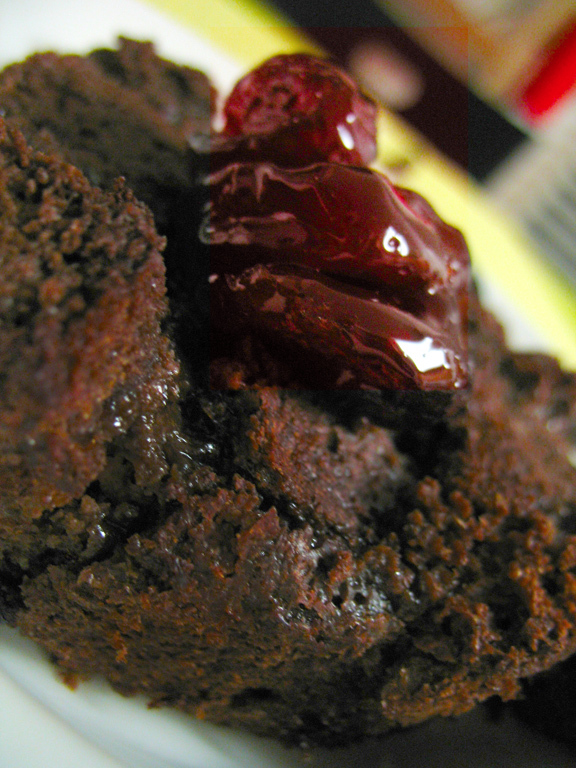 I topped it off with a few of the sticky cherries – really, almost candied – I had made last week, and I highly recommend. Preheat oven to 350. Spread bread cubes out on a baking sheet and bake for about 10 minutes, or until bread has dried out a little bit. Place in a 9-inch square pan; the cubes should mostly fill the pan. Sprinkle currants over the bread cubes. In a mixing bowl, whisk together eggs, sugar, cinnamon, orange extract, and almond milk until smooth. Pour over bread cubes. Press bread down with the back of a spoon. If cubes are not totally covered by milk, you can add a little more. Let rest at least 15 minutes, and as long as overnight, occasionally pressing down with a spoon. Bake 30-40 minutes until firm and slightly puffed. Cool 15 minutes before serving. Serve with custard sauce or slightly thickened whipping cream if you like. Pit the cherries. One easy way I recently learned about was to use a metal star tip for a frosting bag. Insert into the cherry where the stem is until it contacts the pit. Twist the star tip around to dislodge the cherry pit, and then pull out. The cherry put should be detached and can be discarded. Place the cherries in a saucepan with the water and sugar. Bring to a simmer and cook for 30-45 minutes, or until liquid has turned very syrupy. Refrigerate until ready to use. Syrup should become very thick.